FileFort Backup is easy to use, free backup software that can backup files to a cloud storage service, FTP server, and other locations. The download page shows more than one download link, so be sure to choose one that says "External Mirror" to get the free version. 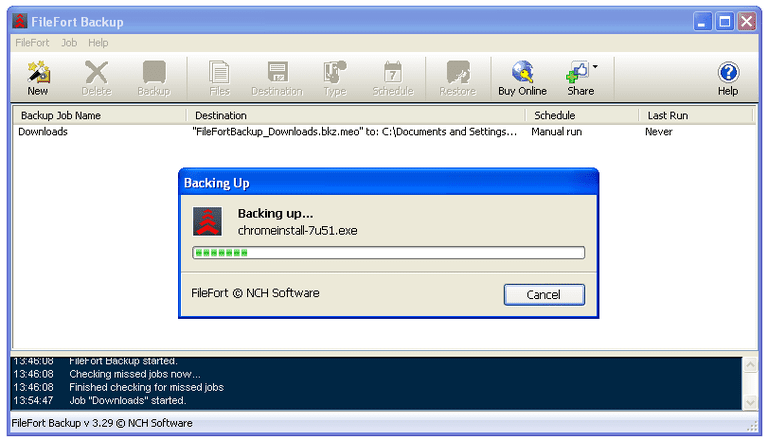 This review is of FileFort Backup v3.31. Please let me know if there's a newer version I need to review. FileFort Backup supports a full backup, historical backup, and incremental backup. Data from a local hard drive, network folder, or external drive (like a flash drive) can be backed up with FileFort Backup. You're able to backup to a folder on the same drive, network folder, CD/DVD/BD disc, FTP server, or an external hard drive. Backing up to a cloud storage service is also supported, like to Google Drive or Dropbox. This turns FileFort Backup, plus your favorite storage service, into a probably very inexpensive online backup service. Though this is a simple and easy to use program, FileFort Backup has a few things that set it back when compared to similar products. FileFort Backup shows descriptions of settings and options when your cursor is hovered over it, which makes understanding how to use the program very simple. You shouldn't have to ever read the manual to use any of the features. I also like that FileFort Backup supports a mirror backup. This means you can browse through the backup like you would the source folder, with all the files and folders in their original structure and easily readable. It shouldn't be necessary to give praise to encryption and password protection support for a backup program, but it's important that FileFort Backup supports this, as some similar products don't. FileFort Backup doesn't support several features you may find in similar backup software. For example, a full system partition or disk backup isn't allowed. I also don't like that you can't pause a backup midway like some backup programs allow. You're able to cancel it completely, but pausing would be helpful. Custom compression and backup splitting isn't allowed in FileFort Backup, which means it's virtually impossible to control how much storage a backup will take up. If the destination doesn't contain enough free space to back up your files, FileFort Backup will throw an error but will not notify you. This means if you're worried about low space affecting your backups, you must occasionally open the program and look through the logs to make sure the files didn't stop backing up due to no disk space. Several unrelated programs try to install along with FileFort Backup, so be sure to deselect them if you don't want them.